In Part I, I argue that there should be more “rivalry” games in Major League Baseball based mostly geographic proximity. In Part II, I share some humorous baseball rivalry videos. Here in Part III, I pull attendance data from the one weekend of the baseball season that MLB does “allow” interleague geographic rivals and see if there is anything cooking. I will start with a quote from a May 31 article by the Baltimore Orioles beat writer Dan Connolly. “I’m not a big fan of this whole “regional rivalry” stuff, because I think it’s a creation and not a reality. Good teams battling for supremacy is what builds rivalries. Dan is right that two good teams going after each other can make a rivalry. It is also true that attendance on weekends and opening day goes up regardless of the opponent. My point is that adding a regional rivalry is like adding an extra really good topping on your pizza. It adds to the flavor whether the team is good or bad and games against bad teams are not going away. Attendance was gathered from all games May 27 through May 30. Many of these games featured matchups between teams from the same city, state, or neighboring states. (Regional rival games) Another set of games was played between franchises much further apart geographically. (Non-regional games) The data was set up to compare regional rival games vs. non-regional rival games on the basis of how these games stacked up against their average home attendance. 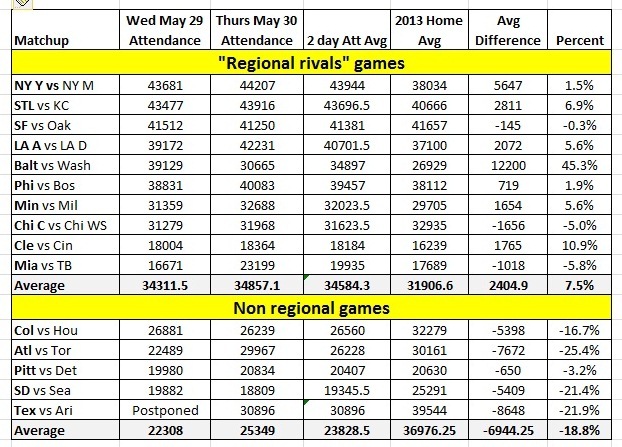 Regional rivalry games beat their average home attendance by 18% on May 27 and 28 and 7.5% on May 29 and May 30. 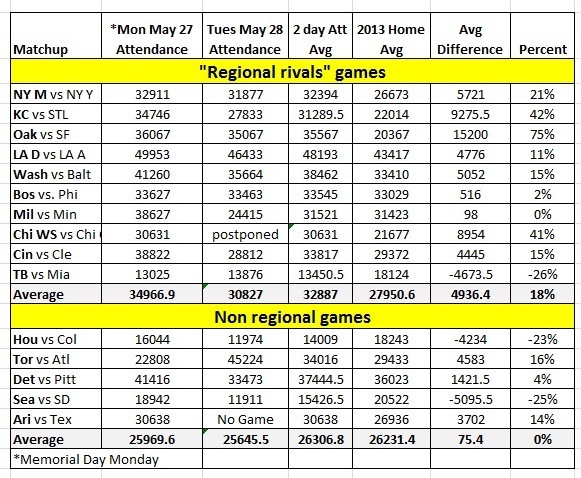 On the same set of days, non-regional games performed about average on May 27 and May 28 with their normal attendance and were 18.8% below average May 29 and May 30. In summary, on the same set of days, regional rivals performed 18 to 25 percent better than their non-regional games. Here is the data and the tables will show the findings. Here are some specific take- aways. Collectively, regional rivals games performed much better against their home average than non-regional games whether teams were winners or not. It is not about interleague, it is about geography. Kansas City’s Kauffman stadium will be red when St. Louis plays. There will be bay bridge traffic for games in Oakland when they host the Giants. Mets Citi field fills up for the Yanks. St. Louis, San Francisco, and New York generally do well at home no matter who they play. Cincinnati and Cleveland’s battle of Ohio does not make a super-hot ticket, but it helps. Minnesota/ Milwaukee and even the cross town Chicago match up did not pack their parks. The Chi-town attendance data is not compelling of a strong rivalry this year. The Orioles/Nationals and Dodgers/Angels fill up the house. Beach beats baseball in Florida no matter who is playing. A major league team in Vermont would probably draw better than Tampa and Miami. One of these teams could move to Mexico City and I don’t think anyone will get off their beach towel. There is no evidence of any interest in long distance interleague games between May 27 and May 30, 2013. There is strong cultural difference between DC and Baltimore and it made the Nationals/O’s series even that much more enjoyable.